Dublin has a brilliant new tapas bar in this place. It's the best tapas I've eaten without a trip through the airport.. I was eight when I had my first plate of calamari. The lemony rubbery piping hot mouthfuls were as exotic as the light-up yo-yos my Dad bought for us from a passing Spanish street seller that balmy night on our first family holiday abroad. Maybe it’s the bone-warming heat or the holiday beers in the middle of the day. But it’s hard to find tapas that taste as good as they do in Spain. Las Tapas de Lola is a small restaurant on Dublin’s Wexford Street, a strip that tends towards the costa del drink more than a prime spot for eating. We’ve piled in for a family dinner after a damp park trip in the hope of tasting some holiday food. This place is a smart metro-tiled buzzy joint with plenty of canopied street tables for outdoor eats. Beautiful black and white photographs of old Barcelona adorn the walls. My four-year-old is struck by one of the contents of a plate of chanquetes, whitebait served “Cadiz-style”. “Oh he’s really cute,” he announces, followed quickly in a matter-of-fact tone: “he’s dead. He’s a dead fish.” The long menu lists plates priced between €4 and €7. We order a bottle of Estrella Inedit (€15.50), Ferran Adria’s beer, designed, the waitress tells us, to be a beer to go with mineral-rich foods such as asparagus and artichoke which don’t go well with other drinks. Although her other theory is that it may be “just an excuse to put beer in a fancy bottle.” And fancy it is, 750ml, wine bottle height and served in a cooler. A parade of lovely things follows: toasts with grated tomato and garlic, that plate of tiny whole whitebait, heads and tails, lightly salted and flash-fried till crunchy. 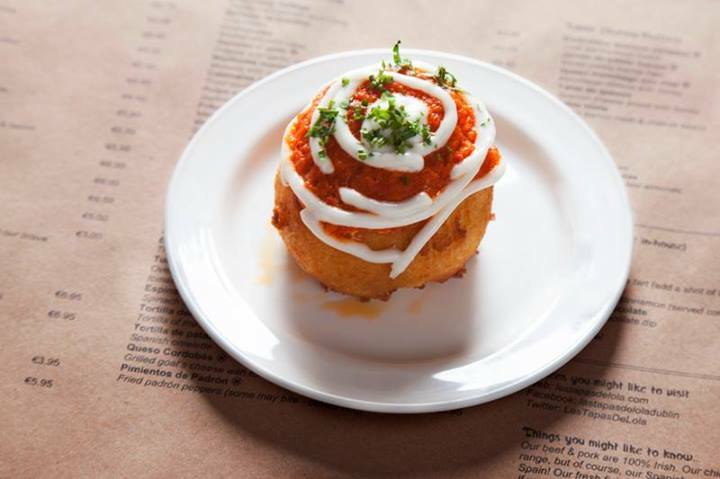 There’s a Bomba de la Barcelona, a larger than golfball-sized spicy meatball, breaded, fried and topped with brava sauce and alioli. It shouldn’t work but it does. The paella of the day takes a while to come in this heaving busy place but it’s worth the wait. Saffron drenched rice with peppers, onions, clams and calamari scissored into strips. And the last fork is as good as the first. There’s a Carrillada de Cerdo, pig’s cheek marinated in a tomato and cumin sauce that is delightful. And the fish-without-a-face dish comes in the form of chewy bunelos de bacalao, or cod fritters. Tiny strips of berenjenas fritas, battered and fried aubergine are served with a dipping pot of maple syrup. The oily-meaty skin-on aubergine is just about robust enough to take the dunking in sticky brown syrup. A creme caramel and churros with chocolate sauce finish it all off. The churros come with a sooty chocolate sauce that the boys eat with dipped fingers once the doughnutty bits are gone. Dublin has a brilliant new tapas bar in this place. It’s the best tapas I’ve eaten without a trip through the airport. If the sun’s not shining this weekend sit on the street anyway. Shut your eyes, turn your face up to the wall heater like the meerkats in Dublin Zoo and pretend.